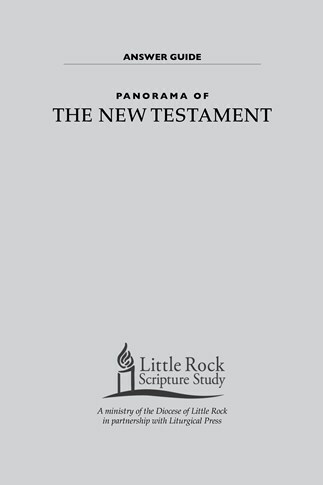 This study has 5 sessions, the Study Set includes the Study Guide by Catherine Upchurch and a commentary Panorama of the Bible: New Testament by Stephen J. Binz. Stephen J. Binz is a biblical scholar, award-winning author, and popular speaker. He studied Scripture at the Pontifical Biblical Institute in Rome and Jerusalem, and has developed dozens of books and programs in biblical theology and spirituality, including The God of Freedom and Life: A Commentary on the Book of Exodus and Panorama of the Bible: Old Testament (Liturgical Press). He offers keynotes and workshops at church conferences and leads pilgrimages to the lands of the Bible. Information about his work may be found at Bridge-B.com. You are invited to enter the biblical story of the New Testament beginning with the gospels and working your way through the final book, Revelation. Discover God's plan of salvation running throughout the story and characters, both familiar and unfamiliar. A wonderful way to begin New Testament studies but also a lovely way to look back over the journey you have already taken. These lectures correspond to the five sessions outlined in the Study Set for Panorama of the New Testament.